My God is not a buffet! When you live in a country as great as ours, it’s easy to take for granted our bounty. We are used to having things done our way. We live in a “now” society that gives us any and everything we can afford. Our carnal selves actually feed off this abundance and as long as the carnal body has nourishment like this, it will be strong and difficult for us to handle. There must be a separation of our spiritual and carnal selves. It was first explained to us in Romans 6 that when we were baptized we put to death the “old man” and that we live anew in Christ. It seems as though we keep nursing the old man back to health. You see, when we take God’s principles to heart, we bear fruit. According to Rom. 6:17 we are to obey from the heart that form of doctrine delivered to us. We can not take the things God offers like we take food from a buffet. 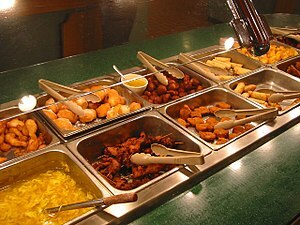 At a buffet, you do not have to eat everything — although some people try. At the buffet you can have whatever you like and leave what you don’t like. God did not send his only son to die for the sins of the world only to see us commit partially to him. God wants us to surrender all and as much as he loves us, he expects us to honor him with our whole lives. There should be none of this “I’ll submit to the things that I like and I’m a work in progress for the rest”. We are to love because God loves us; we are to forgive because God forgave us; we are to treat others with respect because it honors the God we serve. So many claim to be children of God, but treat him like a buffet. I was counseling a young lady who was having difficulty potty training her son. This kid was so smart that he would potty on himself and then bring a diaper to his mother so she could change him. Clearly, if this kid could bring the diaper then he could certainly make his deposit into the toilet like anyone else. At the time that we can acknowledge our sin, we need to cut it out. Simply acknowledging our sin is like the boy who brings his mother a diaper for him to be changed. We need to do better than that!